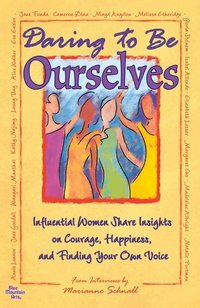 Excerpted from the book Daring to Be Ourselves: Influential Women Share Insights on Courage, Happiness and Finding Your Own Voice by Marianne Schnall. Copyright © 2010. Excerpted with permission from Blue Mountain Arts. Over the course of my career as a freelance journalist, I have had the great pleasure and privilege of talking to many of the world's most interesting and influential women, from actresses to activists, comediennes to poets, recording artists to Nobel Laureates. In my new book, Daring to Be Ourselves: Influential Women Share Insights on Courage, Happiness and Finding Your Own Voice, I decided to bring together some of the most inspiring and empowering quotes from these interviews, broken into topical spreads and addressing a range of issues like equality, overcoming adversity, aging, beauty, finding balance and being more connected to the earth. My hope is that the book conveys the important message that when we dare to be ourselves -- when we embrace our power, speak our truth, and believe in our dreams -- we can change the world. The following excerpts are a sampling of some of the amazing women, themes and reflections featured in the book. What Message Would You Most Want to Instill in Young Girls? We need to help them really internalize the message that good enough is good enough. We don't need to be perfect. We're not supposed to be perfect; we're supposed to be complete. And you can't be complete if you're trying to be perfect. I get very frustrated when I hear women saying, "Oh, feminism is passé," because I think feminism means empowerment. Men can be feminists, too! Many men are feminists. We need feminism. It's not against men; it's about the empowerment of women. It's the respect of women--giving women equal rights, the same opportunities. It doesn't matter what word we use, if it has the same content, it will be treated in the same way. There are other words--there's "womanist," there's "mujerista," there's "women's liberationist"--all mean the same thing and they get the same ridicule. I think we just need to choose what word we feel comfortable with that says women are full human beings, and whatever that word is, it will get a lot of opposition. But it will also attract a lot of support. But this is a revolution, not a public relations movement. We may encounter many defeats, but we must not be defeated. It may even be necessary to encounter the defeat so that we can know who we are. So that we can see, "Oh, that happened, and I rose. I did get knocked down flat in front of the whole world, and I rose. I didn't run away; I rose right where I'd been knocked down." That's how you get to know yourself. It's time to do something about [the environment]. And if we don't do it now it's going to be too late…. I think people get scared that they're not going to be able to do it perfectly, they're going to be criticized, they're going to be like, "Well, I'm not totally green." Well, you know what? At this point, we don't care. Just a shade of green is enough right now. Move a little bit closer toward this. Because the more people start moving closer and closer to it, that's something that collectively makes a difference. I always thought that people told you that you're beautiful--that this was a title that was bestowed upon you, that it was other people's responsibility to give you this title. And I'm sick of waiting, people! I think that the world is pretty cruel to women in what it considers beautiful and what it celebrates as beauty. And I think that it's time to take this power into our own hands and to say, "You know what? I'm beautiful. I just am. And that's my light. I'm just a beautiful woman." We're changing ourselves to fit the world instead of changing the world to fit women. Get over the feeling that the two words don't go together--women and power. The fact is, if we don't put the two together and don't understand how power changes complexion in the hands of women, then we're not going to make it. We have to own our personal power. In my opinion, the most important thing as a woman leader--and I learned this early through a whole bunch of great women who were in my life (and men, I have to say)--is that if you have a position of leadership and power and you don't use it in a different way, then you're wasting it. So when people used to say to me when I was the first woman president of PBS, "Well, you know, does that mean that as a woman you're going to be a different kind of president?" And I would say, "Well, I hope so!" What is Your Wish for the Children of the World? Just be what it is that you are, and that is just fine. You don't have to be what you're not in any way. Live that and live that fully, and that is where you discover ecstasy. You can't really have ecstasy as something other than yourself. Excerpted from Daring to Be Ourselves: Influential Women Share Insights on Courage, Happiness and Finding Your Own Voice by Marianne Schnall. Copyright © 2010. Excerpted with permission from Blue Mountain Arts. This excerpt was also cross-posted at The Women's Media Center. As a freelance journalist, Marianne Schnall has interviewed many of the world's most interesting and influential women. In Daring to Be Ourselves, she brings together for the first time the most inspiring and empowering quotes from these interviews. The result is a compelling collection of insights and words of wisdom from women such as Maya Angelou, Jane Fonda, Gloria Steinem, Madeleine Albright, Jane Goodall, Melissa Etheridge, Cameron Diaz, and many others. A diverse group of women of all ages and backgrounds is included in the book--from actresses to activists, comediennes to poets, recording artists to Nobel laureates. Their voices come together as one as they speak out on a variety of important issues, like equality, overcoming adversity, aging, finding balance in life, taking care of the earth, and more. Thought provoking, enlightening, and even humorous at times, this book is a valuable resource, and makes a perfect gift, for women and girls everywhere. Marianne Schnall is a widely published writer and interviewer. She is also the founder and executive director of Feminist.com and cofounder of EcoMall.com, a website promoting environmentally-friendly living. Her interviews with well-known individuals appear at Feminist.com as well as in publications such as O, The Oprah Magazine, Glamour, In Style, The Huffington Post, the Women's Media Center, and many others. Through her writings, interviews, and websites, Marianne strives to raise awareness and inspire activism around important issues and causes. For more information, visit Marianne's web site at www.marianneschnall.com.